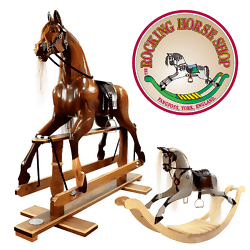 Our Rocking Horses are individually hand carved and finished in Yorkshire, England, in our own workshops. They are available direct from us, the makers, so we are able to keep our prices affordable whilst maintaining the highest standards of quality. We use only the best quality materials including hardwoods from sustainable sources and because we have our own wood, leather, hair, paint and metal workshops, we give a very personal service plus there are lots of choices! 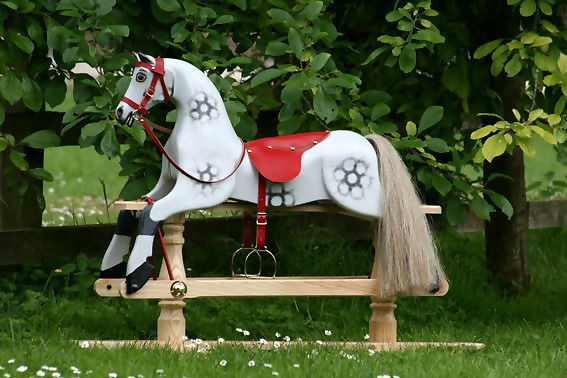 A Rocking Horse is a much loved and valued member of the family; therefore we make it our business to hand craft each of our horses to match each and every client's personal specifications. You may see a Rocking Horse as an investment or as a family heirloom to be handed down to future generations; a piece both decorative and functional that will never lose its appeal. Our specialist craftsmen and craftswomen also lovingly and sympathetically restore old and endangered rocking horses, bringing them back to life, as if they have been reborn into another era or even century and resetting the clock for many more years to come. With clients from all corners of the globe, our reputation for quality and service is at the heart of everything we do. We are a small and friendly team who are always happy to help, whatever the nature of your enquiry. If it’s Rocking Horses, we do it! NEW Classic Black Beauty Rocking Horse. Approx finished size: 66″ long x 52″ high x 24″ wide. We can all remember the story of Black Beauty and would love to have been able to ride him, well now we can! 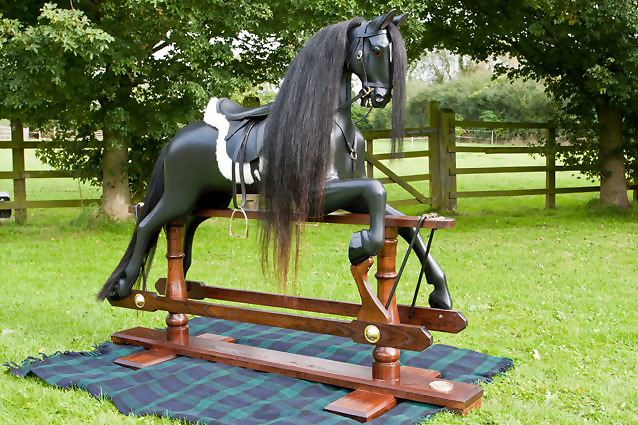 This beautiful extra large rocking horse has been made to look just like Black Beauty, with hoof raised and traditional english riding saddle, ready for a gallop across the fields. This horse has extra carving throughout and even has the horse shoes carved. Extra care has been taken in the detail and Michael, our carver has spent many hours adding lots of special features. A beautiful hand carved large dapple grey Rocking Horse for children from 3 years to adult. Each ‘Garrowby’ horse is hand carved and finished by our own highly skilled team and features top grade leather bridle and saddlery, horsehair mane and tail, solid brass buckles, brackets and stirrups and mounted on an ash safety stand with turned posts. ‘Garrowbys’ are traditional painted dapple greys with your choice of hair and tack colours. ‘Rocky’ is our new Medium size laminated design. 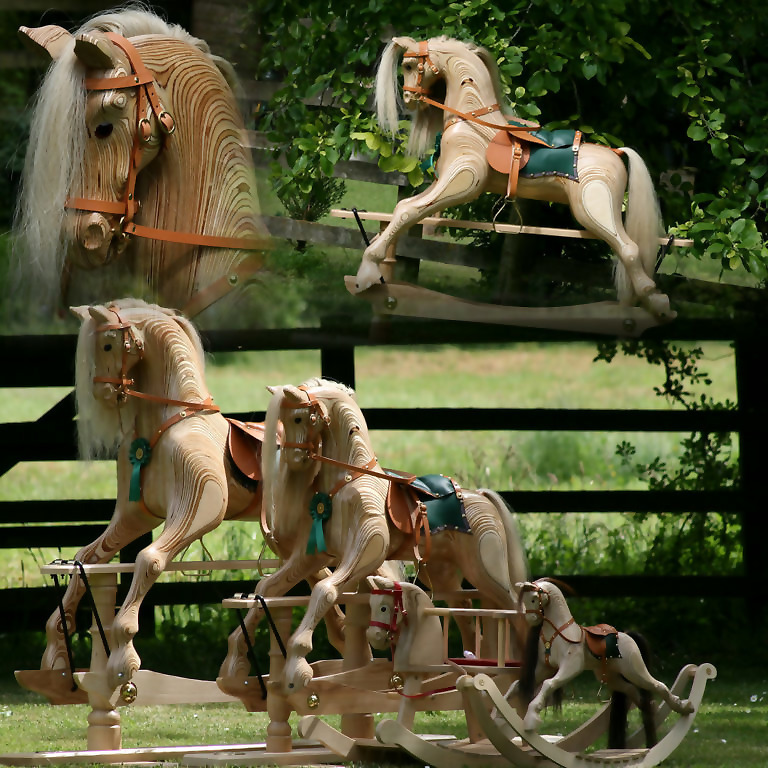 Each horse is hand carved, clear varnished and finished by our own highly skilled team and features top grade leather bridle and saddlery, horsehair mane and tail, solid brass buckles, brackets and stirrups and mounted on an ash safety stand with turned posts. Meet ‘Hero’ ….. because everyone needs a Hero. 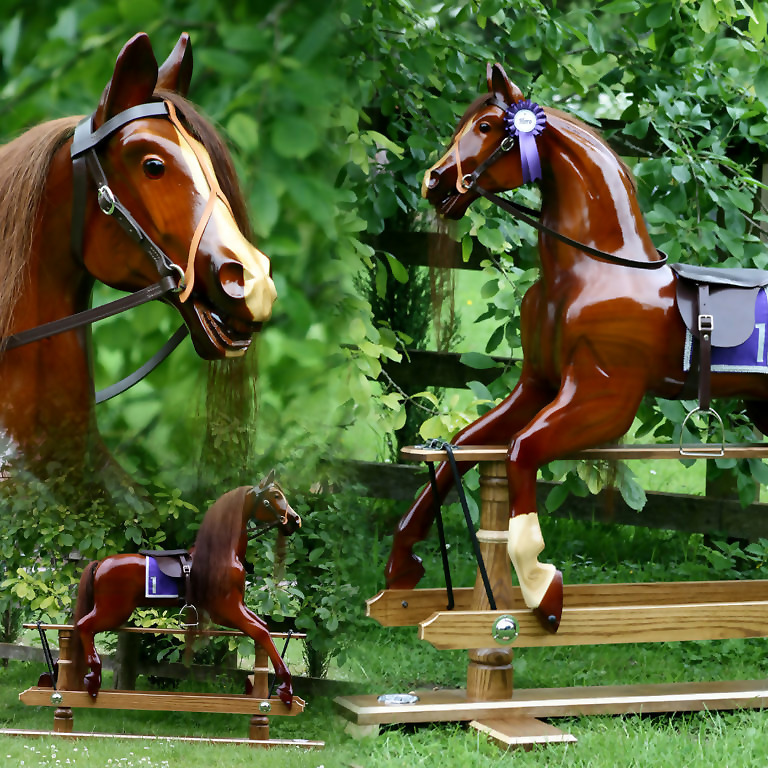 This beautiful large rocking horse has been designed and made with love. Our latest design has been carved from Tulipwood with extra carving, the legs look like the horse is moving and although the horse has been stained, the front leg and blaze have been left natural wood, it really is stunning. The saddle and bridle are well designed replicas of racing tack. 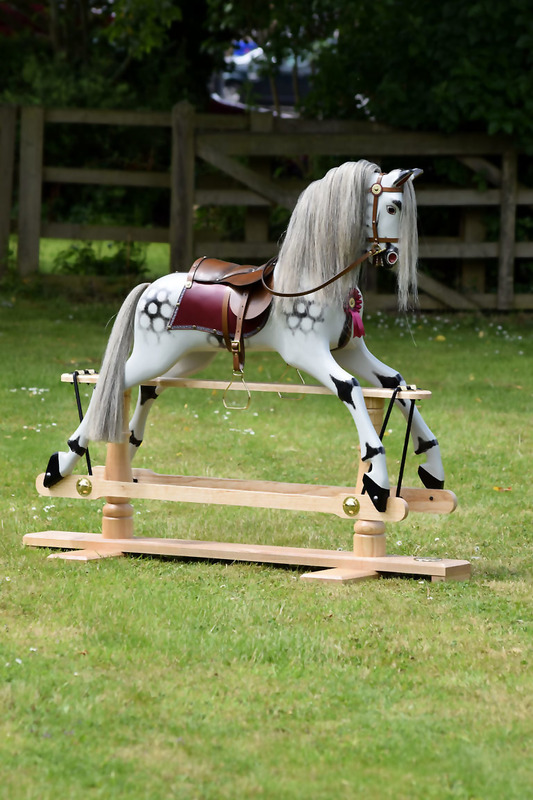 The ‘Little Rocky’ Chair Horse is a safe simple rocker for very young riders. Secure seat & gentle rocking action for the younger child. Made from high quality birch plywood, with a fully carved head and leather bridle. A great first rocking horse. A great little Rocker! This lovely Rocking Horse has a carved head, neck & upper body. A great horse for children aged up to six. 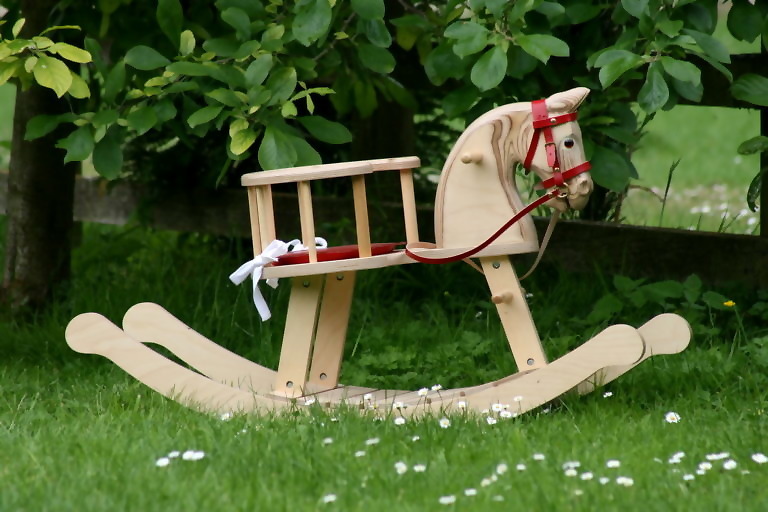 Made from solid tulipwood, on an Ash stand, the Little Red Rocker is an excellent Rocking Horse for children up to the age of six. Available in either a clear varnish or dappled.